Last year, I had an aha! moment while on a Twitter chat (by the way, if you’re an educator, Twitter chats are the place to be for ideas galore!) Every year, in our progress reports, we were grading students on their social and personal development, which had become a rather meaningless piece of information for teachers, students, and parents. Someone on the chat mentioned that we actually have to teach our students the soft skills they’ll need for the work place. This made so much sense to me. I realized that, although the social and personal development skills we were grading did connect to wider life and career skills, the wording didn’t make this clear. For instance, telling a parent that their daughter “organizes materials” often leaves parents wondering about the importance of that skill. Yes, your child organizes her binder and her locker, but, so what? This doesn’t seem life-changing. But it is a fundamental part of the organizational skills which will eventually help students foster a successful life and career. However, it’s not enough to simply assess students in these areas — we need to actively teach these skills in our classes. 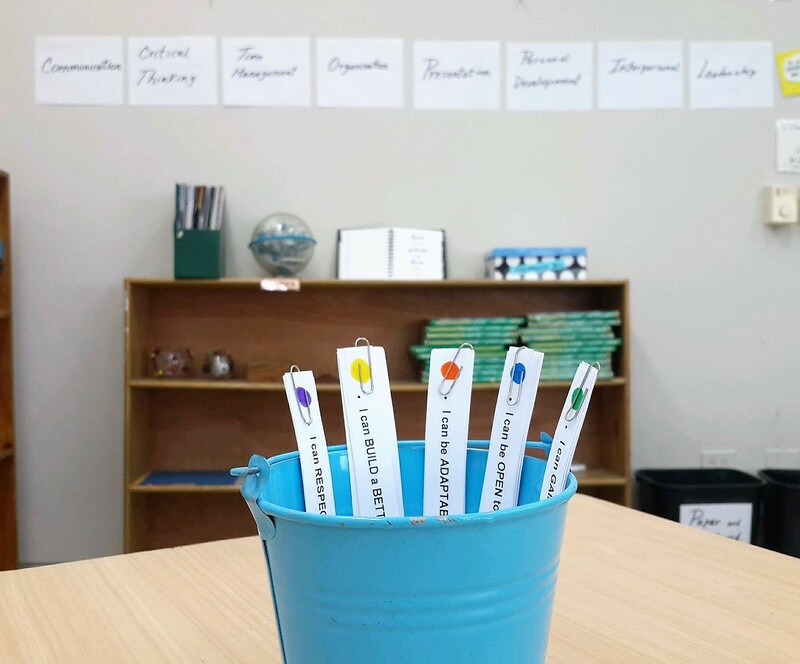 Luckily, Shantal, one of our math teachers, came up with a great lesson for introducing life and career skills to her students so that she could later refer to the skills throughout her classes. Each team had a color and their learning targets were labeled with that color. For example: the green table had eight learning targets, each marked with a green dot. Most importantly, Shantal also told students that they should be trying to implement the various skills while they worked, by using critical thinking skills to solve the problem, oral communication skills to actively listen to each other and express their ideas clearly, and leadership skills to delegate the work and work successfully in a team. The groups immediately began working to figure out the problem. The room buzzed with activity while Shantal walked around and observed to see how students used the various skills in their work. It quickly became clear who had strong critical thinking skills, who had organizational skills, and who naturally took over as the team leader. Once students had placed the learning targets under the skills, they did a museum walk to see if they agreed with all of them. Each skill should have five targets under it (one of each color — i.e., one from each team). Students immediately noticed that some skills had only three or four targets under them, while others had six or seven. So, as a group, they discussed these issues and corrected them. The colored dots worked as built-in clues to help students find their mistakes, especially since some of the learning targets seemed to cross over between personal development, interpersonal skills, and leadership skills. All in all, the lesson took about 20 minutes. Shantal put her Life and Career Skills chart up on her wall (see photo at top) and now refers to the skills whenever necessary during her math classes. In 20 years, her students may not all remember Pythagoras’ Theorem, but they’ll definitely reap the benefits of improving these eight essential life skills. Cool activity! I think that so much of what we target as “academic” problems can be traced back to life skills. A great reminder to keep these in the forefront as we teach our content! I agree Aubrey. I also think that in the long run, the most important thing we teach our students are these skills. Thanks so much for reading!